This guest post by Gareth Edwards was first published in London Historians Members’ Newsletter of January 2015. A longer version of this article, with more images, is here. Look around Endell Street today and you could be forgiven for thinking it just an average London street. But one hundred years ago it was home to an important, and now near-forgotten, part of British history – the Endell Street Military Hospital, the first British Army hospital officially staffed, and managed, entirely by women. That the hospital existed at all was largely thanks to the efforts of two remarkable women – Dr Flora Murray and Dr Louisa Garrett Anderson. Both women had trained at the London School of Medicine for Women. They became firm friends and founded the Women’s Hospital for Children together on Harrow Road in 1912. Both were also heavily involved in the women’s suffrage movement – not surprising, given their own experiences at the hands of the misogynistic British medical establishment. On the outbreak of war in 1914 the pair wanted to serve in a medical capacity, but realised that any direct approach to the War Office would likely end in them being dismissed out of hand. Casting about, they soon discovered that the French Army were desperate for medical staff so approached the French Red Cross with the offer of equipping and staffing a hospital. The French quickly accepted. Within just two weeks the Women’s Hospital Corps (WHC) had begun to take shape. Within three Murray, Garett Anderson and their new organisation were boarding a train for the continent. The 80 year old Elizabeth Garrett Anderson – Louisa’s mother and the first Englishwoman to qualify as a physician and surgeon – watched on from the platform. “Are you not proud, Mrs Anderson?” A friend asked. Their first hospital, established in the disused Hotel Claridge in Paris and known to everyone as “Claridges” was soon taking wounded soldiers and quickly established a reputation as one of the foremost military hospitals in Paris. This was in no small part thanks to Murray and Garrett Anderson’s deft handling of the many military and civilian visitors the hospital attracted. A succession of critical Generals and administrators passed through Claridges and each received a comprehensive tour, their questions patiently answered, however insulting. More often than not they left with a higher opinion of the WHC than when they arrived. In November as fighting worsened, Murray and Garrett Anderson journeyed to Boulogne to meet a hard-pressed Lieutenant Colonel from the Army Medical Service who had previously visited Claridges and been impressed. If they moved the WHC nearer the front, they asked him, would he use them? Acknowledgement of their services at the front did not automatically translate to recognition with the War Office back home, however. The new hospital at Wimereux soon built up its own impressive reputation though and the ability of the WHC to run an effective military hospital became increasingly impossible to ignore. Finally, in February 1915 Murray and Garrett Anderson were invited to London to meet Sir Alfred Keogh, Director General of Army Medical Services. In Keogh they found an unexpected ally. He had read the reports on the WHC coming from those in the field in France and he offered them the chance to make history – he asked them to establish an RAMC military hospital of at least 500 beds at Endell Street in London, staffed solely by women. They agreed and on the 18th February Keogh publicly praised the two doctors and announced the plans to the press. Setting up the hospital at Endell Street was a whole new challenge for the women of the WHC as much of the British army medical establishment was still actively hostile to their efforts. The location chosen for the hospital was an old work house and getting it ready required significant work. Somehow, with little assistance from the rest of the RAMC, they had the hospital ready in time for its opening. The general expectation amongst those opposed to their work was that the Endell Street experiment would fail within 6 months. Under Murray’s capable supervision and thanks to the efforts of all of its staff it instead quickly became one of the foremost military hospitals in London. With this the hostility gradually began to decrease, replaced with a sort of lukewarm tolerance and gentle neglect. Francis Dodd, chalk drawing, 1917. Image: Wellcome Images. Indeed over time the staff would turn this situation to something of an advantage as it allowed them to ignore certain standard British Army practices in favour of new ideas. Murray believed psychological wellbeing was as important as physical when it came to recovery and wards were bright with many activities laid on for the men. Garrett Anderson meanwhile, along with a brilliant pathologist called Helen Chambers, was able to carry out extensive clinical research. Together they trialled, then deployed, a new compound “Bipp” paste that dramatically reduced the frequency with which surgical dressings needed to be changed. The quality of care delivered at Endell Street and the development of Bipp paste made their achievements impossible to ignore. In January 1917 Queen Alexandra visited. Later that year both Murray and Garrett Anderson were awarded the CBE for their war work. By that time the war ended their success was indeed there for all to see. When Parliament granted the first limited voting rights to women in 1918, Murray ordered their only ever overt political act – a suffragist flag was hoisted in the hospital courtyard, to the cheers of staff and patients alike. Endell Street Military Hospital finally closed in 1919. To say that it changed things instantly would be an overstatement but, thanks to efforts of those who worked there, it represented a huge step in the right direction. Some of the women at Endell Street moved on to great things. One of the younger members of staff there, Hazel Cuthbert, became the first female physician appointed at the Royal Free. Many more however still found their careers limited by prejudice – despite performing over 7000 operations, for example, none of the female surgeons from Endell Street would perform major surgery again. Memorial Plaque. Image courtesy London Remembers.com. On Endell Street itself, little evidence of their achievement remains. The old building that contained the hospital is long gone – replaced by Dudley Court, a red brick housing block. Look around a bit though and you’ll find a blue plaque marking the spot where it stood. It is worth hunting out – a few words to commemorate some awfully mighty deeds. Sopwith Camel, Hawker Hurricane, Hawker Hunter, Sea Harrier. As a small contribution to #RAF100, I’d like to remember in particular a man who – while never in the RAF himself – did build tens of thousands of their warplanes. Boy, did he build them. That man was Sir Thomas Sopwith (1888 – 1989). Remembered mainly for the aeroplane that bore his name – the Camel – Sopwith also gave us many other famous fighter planes, including the Hurricane, the Hawker Hunter and, believe it or not, he was also involved in the Sea Harrier, some 60 years after World War One. In other words, he was building aircraft from barely ten years after the Wright brothers up to a model which is still in use by the US Marines today, over a century of in-service fighter planes. You won’t be surprised to learn, then, that Sopwith himself lived to be 101. Thomas Sopwith, a Londoner, was born in Kensington in 1888. Although his father died in a shooting accident when Sopwith was a boy, he left the family well-off. In his twenties, young Tom enthusiastically embraced the pursuits of adventurers of his standing: ballooning, motor racing, ocean yachting and flying. He was the 31st British pilot to gain his licence. He was also fiercely competitive, competing in and winning speed and endurance competitions. By 1914 he was building aircraft from a small factory in Kingston in addition to running his flying school since 1912. By the end of the war the Sopwith Aviation Company had manufactured 18,000 warplanes in dozens of variants, but most famously the Camel, nemesis of Baron von Richthofen. He subsequently in the early 1920s started a new company with his Australian collaborator and test pilot, the appropriately named Harry Hawker. Unfortunately Hawker died soon afterwards in a flying accident but Sopwith took the company forward from its HQ at Brooklands, designing the Hurricane unprompted and before the government realised the looming need for such a fighter. Until 1963, under Sopwith’s leadership, 26,800 aircraft of fifty-two different types flowed from the production lines of Hawkers and its associated companies. Sopwith remained on the board of the Hawker Siddeley Group until 1988. Knighted in 1953, Sir Thomas Sopwith’s biggest regret was failing to win the America’s Cup in 1934. What a life! Thomas Sopwith Documentary (1984) on YouTube (30 mins: marvellous!). The Wandsworth Prison Museum was founded and has been run by a London Historians Member for the past 10 years. He is a serving prison officer at HMP Wandsworth. He has organised these on-site events during 2018.
and talk during the history tour of the escape. The above events are taking place for a maximum of 20 per event, as part of a small scale celebration of 10 years of the Wandsworth Prison Museum. The venue for the talks is the Governor’s Boardroom inside the prison but all groups will meet initially at the Wandsworth Prison Museum at 11am. The talks and one walk will be for approximately one hour. Name, address and date of birth of each visitor. Visitors must be over the age of 18. One booking per person, which is not transferable as there may be a waiting list should any event be over booked. 100 years ago on the Western Front, the now-legendary army padre Philip “Tubby” Clayton and his colleague padre Neville Talbot recognised the urgent need for a soldiers’ club where the troops could hang out and relax with their comrades when behind the lines. A two storey house in Poperinge (“Pop”) was procured and named after Talbot’s brother, Gilbert, who was killed at Ypres on 30 July, aged 23. Talbot House was born. 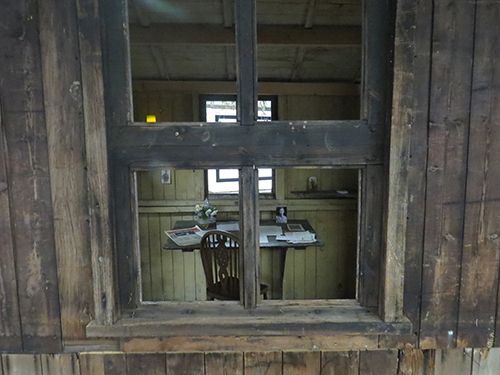 The top floor became a chapel, using a carpenter’s bench for an altar. Tubby estimated over 100,000 attended there during the war, whether for public service or private prayer. The ground floor was a lounge, library and tea room. Alcohol was not served. Talbot House was for all ranks, indeed all were considered equal, hence it was known as Every-Man’s Club. It was an immediate success and continued until the immediate area became too dangerous towards the end of the conflict, after which Talbot House went mobile, using prefabricated wooden sheds. The original Talbot House exists to this day as a museum. 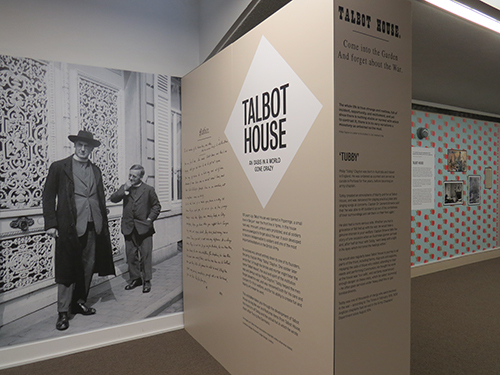 Talbot House is celebrated at a new exhibition at the Guildhall Library. It comprises displays of contemporary objects, bits of uniform, letters, pages of Tubby Clayton’s letters, notes and diaries (very neat writing with all the lines caracteristically sloping up to the right in a pleasing way, uniformly so. The hut in the middle of the display is an actual survival: not a replica. The interior is made up as Tubby’s field office. This display is brilliantly conceived and designed. The signage is logical, clean and informative. The little touches are wonderfully effective, for example the contemporary wallpaper design. The cumulative effect is extremely moving. The Guildhall Library have done great work already on World War 1, including contemporary war memorial photography by their artist-in-residence Simon Gregor (London Historians member). But this Talbot House exhibition is easily the best large display I’ve seen them do. Highly recommended. 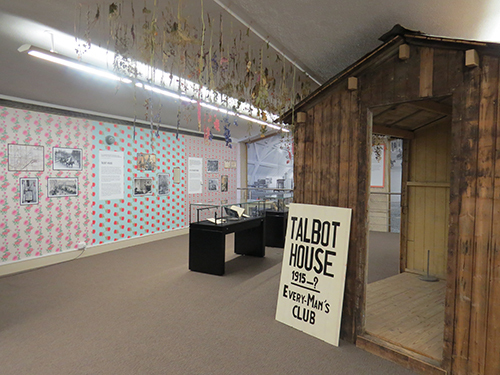 Talbot House: An Oasis in a World Gone Crazy a the Guildhall Library runs until 8 January 2016. Entry is free.